Last Saturday, July 11th, 534 newly identified Bosniak Muslim victims of the Srebrenica massacre were buried at the Srebrenica-Potocari Memorial and Cemetery just outside Srebrenica. Over 20,000 people gathered for the ceremony, which marked fourteen years since the Srebrenica massacre on July 11th 1995. In 1993, during the Bosnian War, Srebrenica was designated a United Nations ‘safe haven’. On July 11th 1995, however, despite the presence of 400 armed Dutch peacekeepers, the town was attacked by Bosnian Serb forces under the command of General Ratko Mladic. It is estimated that 8,000 Bosniak Muslims, mainly boys and men, were killed by Bosnian Serbs and buried in mass graves. The Srebrenica massacre has been classified as an act of genocide by the International Court of Justice and the United Nations war crimes tribunal. The Srebrenica-Potocari Memorial was built in 2003 on the site of an old warehouse which was part of a base for the Dutch peacekeeping troops. The victims that were reburied last weekend were identified by DNA analysis. They were aged between 15 and 84. Most of the bodies were discovered in secondary graves where they were moved by Serb troops during the war in an effort to cover up any evidence of war crimes. It is estimated that during four years of the war in Bosnia over 100,000 people lost their lives and that 20,000 Muslims were missing after the war. Since its foundation in 1996 at the initiative of President Clinton, the International Commission on Missing Persons has worked to ensure the cooperation of governments in locating and identifying those who disappeared during the armed conflict. The International Commission of Missing Persons currently has six facilities in Bosnia and Herzegovina and still actively works to identify the remains of the victims of the country's war. Despite the Dayton Peace Agreement, the war continues to be fought for a considerable part of the local population in their attempts to rebuild their lives and in their quest for missing relatives. The work of the International Commission of Missing Persons is not yet over and many questions and issues of justice remain to be solved. The terms of the UN mandate, which supposedly protected the deliveries of aid, but not of people, continue to be questioned. Although Radovan Karadzic, the former Bosnian Serb political leader, is currently on trial, General Ratko Mladic remains in hiding. It is believed that is in Serbia; why then has he not yet been found and brought to trial? 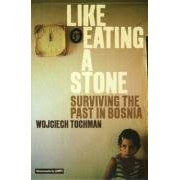 Like Eating A Stone: Surviving the Past in Bosnia by Wojciech Tochman was recently translated and published in paperback (Portobello). This deeply moving and engaging book illustrates perfectly many of these wounds that remain gaping in Bosnia today. Through a series of personal stories, Tochman takes the reader on an emotional journey through the post-war landscape in the company of survivors who are still waiting, searching and grieving for lost loved ones. For further information on the international community’s attitude to genocide during the past half century, read our article Never Again?